This week on A Sound Effect, we have sounds of science and electricity, heavy sounds of vehicles and equally as weighty effects from software and vintage hardware. You will hear classic steam trains with all their bells and whistles, a big dump truck and its turbo engine, car horns from popular vehicles, park ambiences, office supply foley, stylish Steampunk weapons, computer glitches, analog delays, and dark ambiences that will pierce your subconscious. For a wide variety of sound effects, check out these great new libraries! 'Polarity' by Mattia Cellotto gets you the sounds of electricty, science and technology. About half the library is all about electricity, with various types of Jacob's Ladders, Tesla Coils, Ruhmkorff lamp and all sorts of impactful bursts of energy. Then you get welders, plasma spheres, 3D printers, starting to cover a more broad technology theme – like old phones, telegraphs, dynamo wheels, rotary dials, whirling watchers, alarm, lab centrifuges, something scientists call a roller and a rocker, servo sounds, neon lights, a wimshurst machine and sparklers. An impressive collection with some unique recordings, this one is definitely one to check out! SoundMorph has an edgy new library with guns that'll make you wish they were real. 'Steampunk Weapons' has over 40 weapons that are retro-futuristic and grungily sci-fi, each with an assortment of ammo types, old-fashioned or cutting edge body types, and - of course - a series of gears for complex mechanisms that sound both fanciful and completely believable. You'll find SFX of loading, misfires, single shots, and bursts, plus they have names as memorable as their kickback such as 'Back from the Past', 'Angry Daddy' and 'Uber God Gun'. These sounds won't just give your weapons more personality, they'll make the game itself more fun! Jungle gyms, sports fields, whistling birds, and barking dogs. This is a diverse collection of recreational Parks that spans the Southern California area. From quiet city plazas to busy skate parks, this library provides a variety of ambisonic ambiences suited for your next project. 'The Park' by VSCRL FX features all sorts of parks from Southern California and the people and wildlife who enjoy their time in them. This ambisonic library has sounds of children playing on jungle gyms, teens hanging out in skate parks, barking dogs and lively birds, distant traffic, lawn mowers, tennis courts, ball parks, and much more. You can also receive this library in the AmbiX and FuMa ambisonic formats, as well as stereo, 5.1 and 7.1. If you want to go right where these sounds were recorded, then put on your VR headset and check out the 360 video demos! 'Data Disruption' by Glitchedtones is an experimental glitch library with tons of emotive, hard-hitting, data processing sounds. The 200 sounds in this library came from bitmaps, executables, and plugin files that were interpreted as audio data to create harsh glitches, noise, drones, and more. Half the effects are from raw sources, and the other half was processed to sound abstract and powerful, making these sounds ready for your dystopian world or industrial rock and malfunctioning EDM. If you need the distinct sound of unhappy computers, check this library out. 'Volvo A30E Dump Truck' by Pole Position Production features a 23-ton turbocharged diesel dump truck and its powerful 343 HP engine. This library captures the vehicle chugging along at speeds up to 53 km/h with 8 onboard mics, recording the interior, exterior, engine, intake, transmission, and exhaust. It also includes startups, shutdowns, idling, passbys, and driving at various speeds, as well as foley of the doors, horn, flatbed functions and more. Whether you're designing an outdoor suburban scene or looking for heavy sounds for a futuristic vehicle, check this library out. 'Steam Trains' by Tone Glow Libraries features the quintessential sounds of steam trains. This library includes exterior recordings of passbys, whistles, bells, steam blasts, squealing breaks, grinding and clattering on the rails, and platform ambiences. It also has sounds in the passenger cars with door and window foley, refilling coal, and ambiences of the engine; plus, you'll find plenty of sounds from between the wagons. Whether your protagonist is riding to a magical place or trying to escape from the feds, this library has the authentic sounds you need. Looking for car horn sound effects? This library delivers more than 230 sounds in 80 files. It features recordings such as short, medium and long car horn sounds from both exterior and interior perspectives – and includes recordings from cars such as a Jeep Wrangler (2016 and 2004), Honda Pilot (2008), Ford F150 (2016), Volkswagen Beetle (2002), Merzedes Benz E350 (2010), Corvette Stingray (2015), and a Chevy Silverado (2016). Disclaimer: Music in the audio demo is not included in the product. 'Car Horns' by Badlands Sound is a collection of honks from 8 different vehicles. This library features the 2004 and 2016 Jeep Wrangler, 2008 Honda Pilot, 2016 Ford F150, 2002 VW Beetle, 2010 Mercedez Benz E350, 2015 Corvette Stingray, and 2016 Chevy Silverado. The horns are also honked in various lengths from interior and exterior perspectives. Plus there are multiple performances on each track, giving you more than 230 sounds. Whether you have an angry driver or you are creating experimental new warning sounds, if you need honks, look no further. Can’t wait for quitting time? Then have a listen to this sound pack of office & general business related sound effects. Made up of over 100 edited sounds recorded on the job (not in the studio) at 24bit/96khz in M/S Stereo, this pack is a perfect compliment for any office, workplace or business scene. You’ll find sounds of printers, fax machines, photo copiers, paper shuffling, telephones ringing, chairs rolling, paper shredding, cash drawers, elevators, clocks ticking, HVAC ambience and more. Don’t wait until the weekend, pick this up today! 'The Office Foley FX' by Tall Tale Sound isn't a library of recordings from the Dunder-Mifflin set, but if you've seen the show, it has just about all the same props and locations. With 104 sounds, this library includes foley of cash drawers, adding machines, desk drawers, elevators, file cabinets, hole punches, mouse and keyboard clicks, paper cutters and shredders, photo copiers, tape dispensers, telephones, and more. There are even a few ambiences of buzzing halogen lights, humming air conditioning, and ticking clocks. If you need sounds of office appliances and atmospheres, this is the library for you. 'Dark World Vol. 1' by Alexander Gastrell is a designed library with atmospheres that will give an unspoken tension and swirling mood to your ambiences. 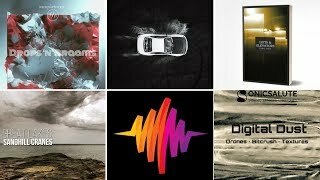 This collection has 50 drones for over 250 minutes of sounds that can be blended to your scenes or used on their own for complex, etherial experiences. Each track uses sound design and musical instruments to create complex, immersive environments perfect for a variety of places such as a 'Deep Cavern', 'Engine Room', 'Cold Cell', or 'Bamboo Forest'. 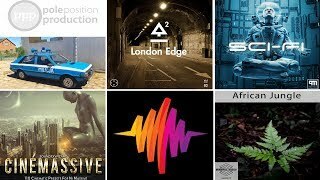 If you want to hypnotize your audience with your soundscapes, these sounds will help you expedite the process. 'RE-201' by Oscillating Particles features Roland's 1973 analog delay effects unit, also known as the Space Echo. This library has 284 minutes of its echoes and oscillating effects for warping, wobbling sounds reminiscent of early sci-fis like 'Forbidden Planet' and 'Fantastic Voyage'. 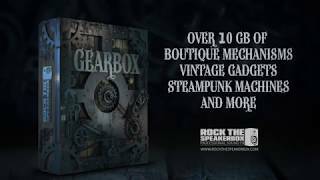 It also has external foley of the hardware body with clicking buttons, turning knobs, and a vibrating motor, and this simultaneously modern and vintage library is available in the full version and a smaller 36-minute 'JR' version. If you want sounds of a vintage Roland unit to achieve that recognizable classic sci-fi feel, give this library a listen.